OAKLAND, California – The NBA Finals start Thursday night without one of its former MVPs in Andre Iguodala. But don’t expect the injured Golden State Warriors forward to gaze upon his two championship rings and MVP trophy to make him feel better, since he is not consumed by his hardware. The Warriors are certainly swearing about their misfortune of not having Iguodala in the Finals opener due to a left leg contusion and left knee bone bruise. Iguodala is slated to miss his fifth-straight playoff game. He suffered the injury after colliding with Houston Rockets guard James Harden during Game 3 of the Western Conference finals on May 20 and didn’t think it was this serious initially. The Warriors said on Wednesday that Iguodala is progressing, but the pain from the bone bruise persists, as well as nerve inflammation in his left knee. For the fourth straight year the NBA Finals will be a matchup of NBA star LeBron James and the Cleveland Cavaliers versus the Warriors. Iguodala earned MVP honors during the 2015 NBA Finals due to his tough defense on James as well as his offensive production. Iguodala averaged nine points, 3.5 rebounds, three assists and one steal in 24.5 minutes per game off the bench in two games against the Cavaliers in the regular season. James offered strong respect for Iguodala before the Cavs practiced at Oracle Arena on Wednesday. “He has very, very quick hands,” James said. “That doesn’t get talked about a lot. His ability to react to the ball either in the flight or while you’re dribbling or while you pick the ball up. But at the end of the day, his athleticism allows him to play some of the premier perimeter players in our league. 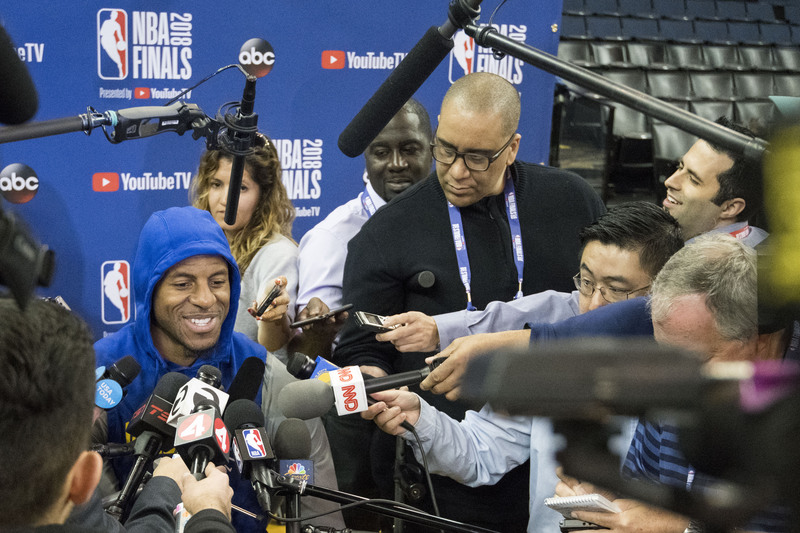 Golden State Warriors forward Andre Iguodala (9) addresses the reporters during NBA Finals media day at Oracle Arena. Whether or not Iguodala is playing in the Finals, expect James to be guarded primarily by NBA All-Star forward Kevin Durant. According to Second Spectrum, Durant guarded James a team-high 77 times in the two meetings this season. Iguodala and Warriors All-Star forward Draymond Green were tied for second, guarding James 17 times. The three-time NBA champion made 6 of 11 field-goal attempts against Durant, 3 of 6 against Iguodala, and 1 of 4 against Green in two regular-season contests both won by the Warriors. James was also successful on his drives to the basket against Durant, according to Second Spectrum, recording 1.5 points per direct drive on 10 drives. However, the Cavaliers averaged 1.03 points per possession when James brought the ball up the floor. While the statistics lean toward Durant likely guarding James the most, Warriors coach Steve Kerr plans to defend the three-time NBA Finals MVP by committee. James is averaging 34 points, 9.2 rebounds and eight assists through 18 playoff games. Iguodala isn’t feeling down about not being able to suit up for Game 1. The introspective 34-year-old won’t allow his mind to go there because he believes it will stunt his recovery.